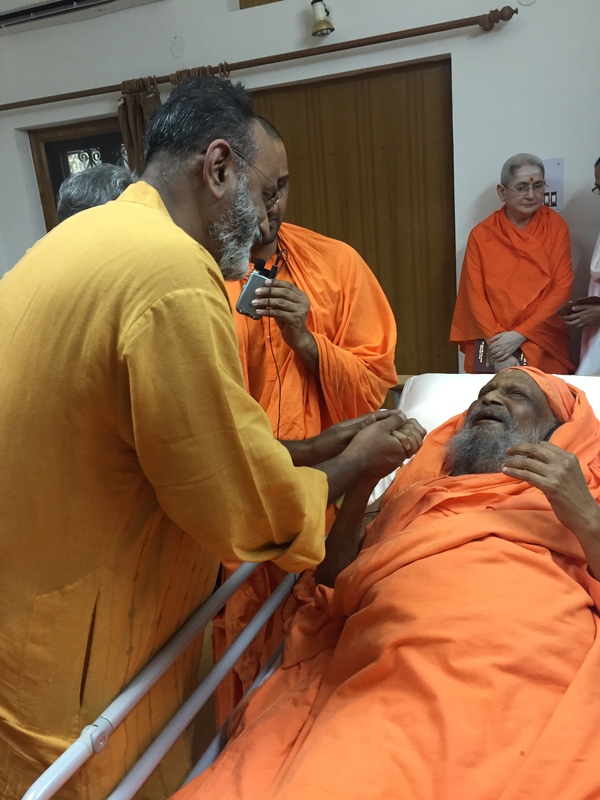 Anything I write about Pujya Swamiji Dayananda Saraswati, will not do justice to him or his achievements in preserving, protecting and promoting Sanatana Dharma. I am also severly underqualified ! However, there is one private matter between us that I must share. In the last five years, that I have been interacting with him closely, his advice to me whenever, I updated him on my various activities was to always balance my work and dharmic activities.He could clearly see my proclivity to be a full-time activist and cautioned me against it. He made me the trustee for AIM for Seva to channel my energies. Many a time I had to literally forcefully extract a blessing from him for a long term project I had shared with him in my early interactions with him. It was as if he knew I was not ready for it. He always wanted me to continue my commercial activities, knowing that I was not ready for it. Finally at my last emotional interaction with him at Rishikesh 3 weeks before he attained Mahasamadhi, I reminded him once again about my earlier request and sought his blessings for the project with a sense of desperation. He smilingly told me I had a lot of work to do, he repeated it again and said ‘you have to work hard’ ‘you have a lot of work to do’ and a gently added “Bharat ke liye”. In those final three words, I found a renewed sense of energy and purpose for my life and a confidence that project I shared with him will indeed become a reality. With his blessings of course.